While Calligra 2.4 did not make it as part of openSUSE 12.1, its latest beta is available in the KDE:UpdatedApps repository and I hope Tumbleweed will pick it up too. I'm quite excited about this release and I'd like to share why! As you might or might not know, Calligra is the result of a split of the KWord maintainer with the rest of the KOffice team. The ODF based Suite has a wide range of applications. From Krita, the most versatile and usable sketching and painting application on Linux (click for an experts opinion), and Kexi, the most powerful and complete database tool available as Free Software - to Words, Karbon and Stage. These last, as well as all the other applications in Calligra, are far less mature than Krita and Kexi. The team has been limiting their scope, focusing on getting them stable and usable while skipping on features. The most interesting part of Calligra is its architecture. Calligra developers call Calligra 'the webKit of office suites' because the applications are only a thin layer over the powerful core. This design has proven itself when the Calligra developers ported their applications to platforms like Nokia's N9 (where it ships as standard office suite) and KDE's Plasma Active. There are currently four distinct GUI's for Calligra Core! For me, the exciting part about Calligra is that it's fast and easy to use. OpenOffice.org and later LibreOffice always suffered from performance and stability issues and the betas of Calligra have been extremely nice in those regards. The UI is also a delight compared to the competition. Words has a few nice improvements compared to the previous version and it's far more useable on a small, wide screen laptop. As I only write basic documents and don't use fancy features in my presentations, Words and Stage suit me quite nicely - while keeping my rather slow laptop from cranking up the cooling fan. The app I use most is Stage, the presentation tool. It works quite comfortable compared to the competition, faster and more stable too. The coolest thing I was looking forward is the Infinite Canvas support in Stage, which will allow it to do Prezi-like presentations. Would be great to have such a cool feature in a proper presentation app instead of needing flash or having to build SVG files by hand... Unfortunately it's not there now but planned for the next release. You can get Calligra stuff for openSUSE by just clicking here (One Click Install)or by adding the KDE:UpdatedApps repository by hand. Currently it's all at Beta 3 but of course newer versions will be packaged in no-time! Help or tips are appreciated. This stuff does not seem to be documented anywhere, at least not n00b-style. If I manage to get this working I promise to write a 'how-to' to turn an OBS project using a 'fixed' tarball into a 'nightly building' thing pulling directly from a SCM - there are quite a number of projects who would probably love this. I'll also try and provide nightly-build Calligra packages for other distro's. I tried the beta version in OpenSUSE 12.1, but I must say that I found it too weak for my personal needs. I write lots of documents, so I tested Words first. I tried to import a document written with LibreOffice that uses background images for pages, and lots of styles (I love styles, they come very handy when creating professional documents, whitepapers, articles, ...) But unfortunately, I quickly discovered that background images were nowhere supported, that the styles and the GUI that goes with it are completely unusable, let alone using styles for other things than paragraphs, i.e. pages or characters. All in all, my feeling about Words is that it looks more like a photo editor with text editing capabilities added to it than a full-blown document writing environment. 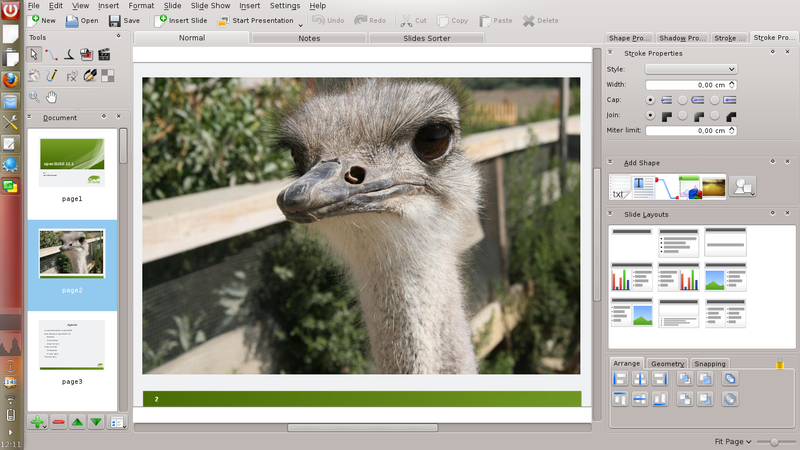 I quickly went back to LibreOffice, but I will definitely keep an eye on Calligra, and I hope it will quickly become at least as rich and usable as LibreOffice. Thank you for putting your energy in making the next-gen of office suites a reality. Cypher: Please try it again and tell us what you think. Just a couple of weeks ago a number of bugs regarding inheritance in styles were discovered and fixed. This was the immediate reason that we extended the beta programme from 3 beta versions to 5. Version 2.4 beta 4 is out now and contains the style fixes. Beta 5 will be out next week. Unfortunately you are still right that you cannot manipulate all aspects of a style yet. That is something that we will work hard on for the 2.5 release. But you should be able to use the full potential of the styles that you already have. And if you cannot, we are extremely interested in reports about it. Jos, it would be helpful if you could stop implying that the split was the problem of one person. It was not and you know that. It isn't helping. It's done and we should move on. @hrvojes: will take a look at it, tnx! First of all, thanks for the work you and your fellows are doing with Calligra. Even a odt file with several styles had problems: the images it contains don't fit the previous text properly, the whole document have several changes if it is open with LO or with Calligra Words. I took several snapshots with KSnapshot, but i don't have a imageshack o picasa account, so I can't to give you links. Could the problem with the docx perhaps be derived from its file name? I noticed it contains spaces and Spanish accented characters.